Brighter, Whiter Teeth in Less than One Hour! Many things we do on a regular basis can contribute to stained teeth. For example, smoking cigarettes and drinking beverages like coffee, tea, cola and red wine can discolor the teeth. Teeth whitening (or bleaching) is a simple, non-invasive dental treatment used to whiten and brighten the natural tooth enamel, making it an ideal way to enhance the beauty of your smile. Because having a bright, luminous smile is the number one aesthetic concern of most patients, Lynnfield Dental Associates offers two great options for achieving a whiter smile. 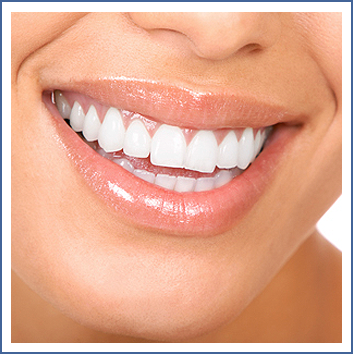 We use the Sinsational Smile® whitening system for our in-office whitening treatments. It is a fast, effective method that only takes 20 minutes to complete. The patented, pre-filled silicone tray allows you to remain totally comfortable and keep your jaw relaxed. Your dentist will then use an LED light to accelerate the effectiveness of the whitening gel’s active ingredients, so you can spend less time in the dental chair and more time showing off your new, brighter smile. You’ll also be provided with a whitening pen at the end of your treatment to help maintain the effects of the procedure. We also offer an at-home tooth whitening system that will whiten teeth dramatically. This method usually requires two visits. During your first appointment, we’ll take detailed impressions (molds) of your teeth. These will be used to create customized clear plastic trays. During your second appointment, you will try on the trays and adjustments will be made to ensure a comfortable fit. Your dentist will give you instructions for using the whitening solution. The trays are worn with special whitening solution either twice a day for 30 minutes or overnight for a couple of weeks depending on the degree of staining and desired level of whitening. It is normal to experience tooth sensitivity when whitening your teeth, but this usually subsides shortly after the treatment is complete. Since the whitening solution only works on natural tooth enamel, we will evaluate whether any old fillings or crowns will need to be replaced after bleaching is complete so that they match the newly whitened teeth. Tooth whitening is not permanent, and a minor touch-up may be needed every few years. At Lynnfield Dental Associates our dentists are experts with years of experience in tooth whitening. We will help you choose the method that is best for you and will provide after-care instructions to help you maintain your bright white smile. As always, proper oral hygiene, good eating habits and regular dental visits are recommended following your tooth-whitening procedure. Feel free to contact us with any questions about tooth whitening or to schedule a smile consultation with one of our doctors.